120-volt flat electrical cable is used for wiring outlets, switches and standard lights. 120V flat cable has the individual conductor wires aligned side by side for a flattened shape that fits through slim openings. The flat shape allows manufacturers to wind several yards of the cable around each spool. Care is required when cutting the 120V flat cable jackets to gain access to the wires, but the wires are stripped and connected like any others. Outlets and other electrical items are often wired with flat 120V cable. Slip the point of a utility knife between two of the wires under the jacket of a 120V flat cable with the sharp side of the blade facing away from the inner wires. Slowly cut the jacket lengthwise without allowing the blade to contact the insulators on the wires within. Cut at least 2 inches down the jacket, pull the individual wires through the slit and cut away the loose jacket. Strip 1/2 inch off the insulation of the individual wires with wire cutters. Three-wire flat 120V cable has a white neutral wire, a green insulated ground wire and a black hot wire. 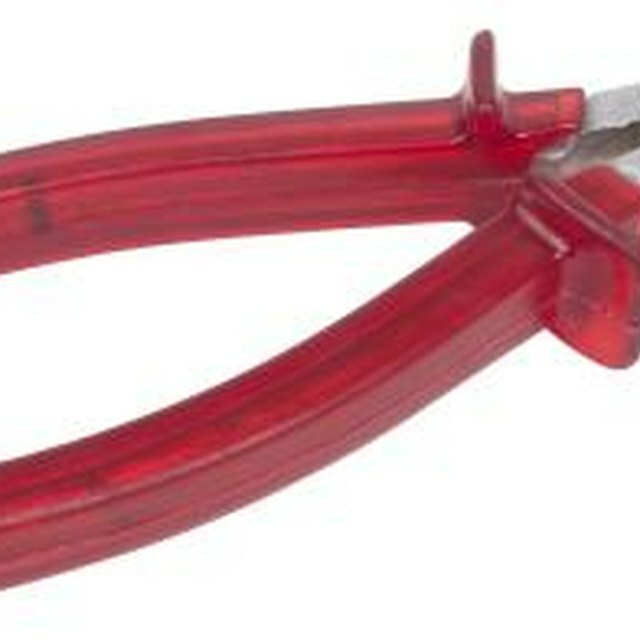 Four-wire flat cables have an additional hot wire insulated in red. Cut into the insulation gently enough to preserve the copper conductors within while stripping the wires. Connect the 120-volt wiring to electrical terminals on switches, receptacles and breakers with the screw terminals. Slip the stripped bare wire ends into the appropriate terminals and tighten the terminal screws with a Phillips or slotted screwdriver. Make other electrical connections such as those on lighting with 120V flat cable wires by holding two bare wire ends together and twisting a wire nut over them. Do not make any household wire connections unless you are trained and experienced in electrical operations.